Picture this: Me and a bunch of fellow WordPress geeks sitting around a table, eating Mexican food and discussing our favorite WordPress tools. You know what the word for that is? Nerdvana. As we chatted about our favorite tricks of the trade, one tool in particular got a lot of conversation: ManageWP. It’s a super-amazing dashboard where you can manage multiple WordPress sites. Let’s talk about why I love it. Raise your hand if you manage more than 5 WordPress sites. Keep your hand raised if it’s more than 10. If I get to 20 and your hand’s still raised, then bless your heart and put on your dancing shoes — your about to dance a jig of happiness . For anyone managing multiple WordPress installations, you’ll love ManageWP because it consolidates multiple Admin dashboards into one easy-to-use (dare I say intuitive?) dashboard experience. From a single screen, you’ve got one-click access to all of your sites where you can update themes & plugins, do site backups, run security scans, and more. Lots more. So next time Yoast updates his WordPress SEO plugin, no need to login to each of your sites to update it. Log in to ManageWP and click that special UPDATE EVERYTHING button and go drink your coffee while ManageWP does your work for you. Hopefully you know the importance of having WordPress backups for your sites. There are a couple of go-to backup plugins I’ve used in the past, but ManageWP replaces the need for those. You can schedule backups (full backups or just database) and keep a copy of the backup on the server or ship it off to an external destination (supports Amazon S3, DropBox, Google Drive, FTP, and email). If something goes wonky during an update, you can easily restore a site from a backup. It’s painless – you’ll barely have time to register your heart attack over the site crash before it’s back online and working fine! This is the feature that makes me swoon. Swoon, I tell you! The ManageWP Clone Wizard lets you quickly make copies of your websites or deploy websites from the backup files. First you just select the site you want to migrate/clone and then you select your destination. If you’re like me, you have a standard WordPress setup you do for every project. Let’s say you’ve got that clean installation/setup somewhere and you want to copy it over to start a new project. Use the ManageWP Clone Tool, baby. DONE. If you use a development domain for new sites, moving the site over to the live domain is a snap. Clone it. Pick the site you want to copy and then pick the destination. Your URLs will be updated automagically and you’ll be looking at your watch wondering what to do with all the time you just saved. WordPress sites need maintenance. Period. There will always be a plugin that needs to be updated or a tweak that needs to be made. While I’ve always offered post-project maintenance services to clients, ManageWP gives me a platform to offer a clearly defined set of services on a schedule. ManageWP makes it easy for me to scale that service for clients at a reasonable price, too. They’ll have peace of mind that their site is being looked after and I’ll have peace of mind that I could quickly/easily restore their site in case of emergency. Win/win. Speaking of reasonable pricing…. ManageWP works on a sliding scale of sorts. There are tiers of service (you’ll need the Professional Tier for the Clone Wizard) and you pay by the site. There’s no contract, so you can scale up or down as needed. I actually have two accounts – one for standard and one for professional – that allow me more flexibility based on my needs. If you pay annually instead of monthly, you’ll also save 10%. Are you in FREAKING LOVE YET? You can create an account at ManageWP and add up to five sites for FREE. You’ll get access to all the cool paid features for 14 days. Even after that, you’ll still have free access to basic features. It’s a great way to take it on a trial run and see how you like it. What are you waiting for? Go ahead, try it out! I keep looking at ManageWP and considering their service, because I need something like it! Have been using InfiniteWP for the time being due to price, and partly because I have most of a year of my backup subscription still to go. Haven’t figured out which is the right way to go, although having a app for it probably makes it worth it! The price for InfiniteWP wasn’t as attractive to me due to the cost individual add-on’s. But…if I still had time left on a subscription, I’d take a lot to make me move. 🙂 If you try it out, let me know what you think! I love this. At your suggestion a few weeks ago, I got the trial version and then the deal off App Sumo. I too am in love. Thanks for dropping the knowledge, Dils! Glad you’re digging it! Always nice to get a nod from Megan Gray. Why do you have multiple sites, Carrie? Personal projects, or…? Hi Charlie, I make my living making WordPress sites for other people. Most of the time, after projects are done, clients still engage me for maintenance services. Having a tool like ManageWP has enabled me to manage lots of sites from one spot, which is a major time-saver. Do you have any insight or comments on how the clone wizard compares to BackupBuddy? Hey HBG, good to see you around these parts! I have loved and used Backupbuddy, but the site restore feature is requires more effort and tech savvy (IMHO) than ManageWP. For instance, with Backupbuddy you have to FTP the importbuddy file, run the restore, then delete the file. With ManageWP you can do it with a single click from the dashboard. I’ve got no dis on Backupbuddy and will continue to use (I have a 2 site license), but I think the ManageWP clone tool is better. A note though, the Backup and Clone features are only available in the ManageWP Pro package and up. I’m a big fan of BackupBuddy as well, but it looks like ManageWP makes it easier, much easier, to backup And to Clone sites! I beta tested ManageWP and was keen to use it but I was unhappy with storing all the access details on their servers to all our client sites. I asked at the very beginning for a self install version and they quoted me $6000 for the privilege. I used RemoteWP for a while which handles updates, is free and works well but it lacks backups and cloning. I got in on the Beta of InfiniteWP and loved it from the start, self hosted feels a lot safer and it’s worked out much cheaper. The addons are expensive but watch out for the discounted bundles. I bought the first bundle they did and it gives me access to all future addons. I guess it comes down to what works for you. I preferred to pay out a bit more upfront and now my running costs are zero. James Mowery from ManageWP here. Thanks so much for the very kind words about our service. We really do appreciate the great feedback. We’re making sure to keep working hard and continue to innovate with new, great updates for the WordPress community. So, again, thanks so much! Great post Carrie – thanks 🙂 Just one question: WordPress recommends making a backup before upgrading to the latest releases. Does ManageWP do that automatically when you upgrade all of your sites? Thanks again for this great post. Good question! I recommend have scheduled backups for your site – depending on the frequency of new posts and activity on the site – you can go with a daily, weekly, or monthly backup. (I do weekly around here). Anyhow, you can schedule backups with ManageWP (the Professional plan) or with any backup plugin of your choice. Alllll that said, assuming you’re performing regular site backups, you can update plugins/themes/WP with reckless abandon (directly in the dashboard or via ManageWP), always knowing you could roll back (by day or week – your most recent backup) if needed. Holy cow! This is truly fantastic -and one of the best plugins I’ve seen for WP yet (heck! Probably one of the best inventions since sliced bread). I am having the same problem as you. I have about 5 sites I loaded on MAnageWP, and while I like their system and dashboard, I had trouble with 3 out of 5 backups – all of which were either on Godaddy or shared hosting. MAnageWP support was very quick and detailed, but they suggested changing alot of my server configurations which were not possible on my shared hosting plan. It seems I would have to switch hosting plans for myself and clients to more expensive VPS to make the backups functional on ManageWP. Switching to more expensive hosting is not an option for me and the clients right now..especially since backups were workable in my old backup plugin: UpdraftPlus. So im contemplating right now whether I will stick with ManageWP – just fo rthe convenience of the wordpress and theme & plugin updates- or ditch it. Some of our best customers come from cheap hosts that can’t handle the ManageWP backups. It seems a lot of the giant shared hosts have every low limits on how long the script can run before it will terminate and also limits on how much they will allow a script to upload. You dont need an uber-expensive host, just a good one! I hate to sound like a spammer but none of my iHelpers $8.99/mo clients have any issues with ManageWP.. Thank you for the kind words. Sometimes some hosts are a bit harder to work with and that is why we decided to completely reinvent backups. The solution that we are now working on as a part of our upcoming Orion release (beta available) will work on GoDaddy and any other host. We want for the philosophy where we should offer the maximum comfort to the customer so they do not have to think about tweaking anything. Thanks for this informative post Carrie. Sure thing – let me know if you have any questions! Your review sealed the deal for me. I’m clicking through NOW! I saw a presentation of ManageWP at a local WordPress meetup. I was very impressed. I wanted to share some information on ManageWP with a WordPress developer friend of mine who does lots of monthly maintenance on the sites he creates. Your article gives a great review and overview of what ManageWP does and how it works and what the benefits are. Makes it real easy to make an informed decision. So, of course, I shared the link to this article with my buddy. Love your portfolio, by the way! Glad to hear it! Thank you! Update — My buddy, Mike Nichols ended up buying and using the ManageWP. He loves it. Thanks again for writing this article which I was able to share with him so he could make an informed decision! I’ve been using ManageWP for awhile and LOVE it too, but like Alba said back in May, most of my sites are on GoDaddy and can’t be backed up. Didn’t work with BlueHost either. I tried to get ManageWP support to recommend another host that could support their backup, but they didn’t have that info. Do you know what hosts will work with their backups? I’m looking into using Site5 and SiteGround right now. Do you know if you can back up with MangeWP on either of those hosts? Great blog! I’m new to WordPress and your site has been so helpful. You can do manual backups with GoDaddy via ManageWP, I think it’s the scheduled backups that run into problems. While that’s certainly not ideal (part of the beauty is in the automation! ), it is possible. If your budget can manage it, I’d really advise a WordPress managed host (Flywheel, WPEngine, Synthesis) over a shared host like GoDaddy or BlueHost. I actually used to recommend BlueHost, but their service and reliability has been horrendous lately and I’ve removed them from my affiliate list. DreamPress (a new hosting service by DreamHost), might be a good option for you as I think it’s the least expensive of the WP managed hosts. Do confirm with them the ManageWP automation piece first though. I last tried the ManageWP backup on GoDaddy in March, so it could be different now, but at the time their problem was the zip file. They told me: “The only type of archiving that our SSH will allow is a .tar.gz.” Interestingly, I was able to back up the database, just not the rest of the files. I’m just starting out, and most of my clients are too small to need managed hosting. I was planning to use ManageWP to create a monthly maintenance plan for my clients that’s reasonably priced. It seems like the managed hosting plans already include backups, security, updates, etc., so that defeats the purpose of having ManageWP. Their blog had an article: https://managewp.com/wordpress-maintenance-business. I think I’ll go back to them and ask them for their suggestions. Thanks again for your expertise. As you can tell, I’m working my way through your history and learning a lot! Wow, this DOES sound pretty dreamy! I have only done a few sites for clients so far, but it’s already pretty annoying to go into each dashboard for updates. So, thank you for this!! Hi Carrie, thanks for this article. I’ve been using ManageWP for awhile, managing 10 sites so far. I agree with you and others who love its features and well-thought-out UI. However, 2 things about the general concept of remote consolidated WP management kind of deflate my sails a bit. 1) Not all plugins can be monitored/updated remotely (iThemes plugins are a good example of this) so I can never be 100% sure if it’s catching all plugins on every site. So I still feel like there is a need to manually check each site for some plugin updates. 2) How can I be sure that updating a plugin or WP core didn’t break something on a site? Sure I can mitigate the risk with a backup first, but the point is, I still feel obligated to test each site manually to make sure I catch something that went wrong before the client does. Are these things that concern you, and how do you deal with them? You bring up some great pain points. For 2) I think the individual site check is part of the process. Hopefully you’re charging your clients for your maintenance services and building in the time it takes for those individual touch points. 🙂 I will say… I tend to use the same plugins over and over and it’s rare that I have an “unknown” in the mix. So, on sites where I’m using the same core plugins, I do the updates and don’t check the sites. For big version updates or updates to plugins I’m still feeling out, I do go individually check those sites. So far, I’ve only noticed the problem with iThemes, but I admit I haven’t thoroughly tested all the different possibilities. I’m *guessing* that certain other plugins (such as ones that cannot be auto-updated in WP) are subject to this limitation as well. I did open a support ticket to ManageWP about that and they confirmed that some premium plugins are unable to be updated by ManageWP but I can’t remember the exact reason. Hello, I’m not sure if this helps or not, but I have found the Wordfence security plugin to be really good at picking up outdated plugins and sending me alerts when upgrades are needed. I only manage a few sites with ManageWP, and luckily have not had any problems so far with updates being missed, but the alerts from Wordfence are nice to have as additional reminders. I hadn’t run across Wordfence, but thanks for pointing it out as a resource for those edge cases! Heya! I’ve heard great things about IWP as well. The biggest downside I see is that a self-hosted solution takes more effort to get up and running. Otherwise, yes, very compatible service. Your review on ManageWP is very much resourceful. My question is when WordPress recommends for the updates of new release does ManageWP does that automatically? Your response will be valuable to me. Thanks fro sharing the resourceful information. If I’m understanding correctly – no, ManageWP does not auto-update anything for you, it just provides an interface to update multiple sites from one location. I’m looking at making the move from Infiinite WP to Manage WP and I was wondering if you had any problems interfacing with sites using WP Engine or Flywheel. 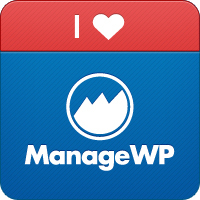 I’m so happy you are so in love with ManageWP. I’m in “like” with it but so far even though I’ve an upgraded plan it has failed to deliver the goods when it comes to Cloning. For the past week I’ve been trying to move some sites but their process either fails or it tells me that they have successfully clones yet the destination is unchanged. I can’t say their support isn’t responsive, but I have not gotten this to work and I’d like to talk to the man behind the curtain to find out what settings are needed to insure success. I suspect it’s probably settings on the destination server but MWP’s advice is kind of vague. Wondering if there’s a secret handshake or something to make this all work. Any advice? Are the sites in question “large”? The only time I’ve had clones fail are on large marge sites. Also, are you going all live site to live site (as opposed to local to live)? I’ve been poking around with ServerPress for doing local to live and the cloning is pretty awesome. Oops, forgot to say, no, not large. 370mb. Is that large? To update. First I think you know this: ManageWP support rocks! Second: after some terrific support by MWP, we are able to clone sites on my hosting service. Seems a “fully automated” procedure isn’t possible at the moment due to some security settings on the web host side. Working on that. Question: what do you recommend for going back-n-forth from a live site to a locally hosted site (MAMP)? Thanks for the update! I’m curious what the security settings/issues are and if they’re something that can be overcome easily enough – kindly do leave another update once the issue is resolved if you can shed any additional light on the cause. I’ve been using MAMP, but recently met Gregg Franklin from ServerPress at a WordCamp and he demo-ed their Desktop Server product. It ROCKS. Right now I’m still playing with the free version, but will likely update to the premium one. Historically I haven’t done a lot of local development – I usually just go for live staging, but I’m finding that I like the workflow better in a local environment (just easier to do all my dev in a proper editor and not have to FTP/SFTP every change.) Do you have a system you like? I’m going live to stage, actually. Ok, since I last posted on this topic (ManageWP) I spent LOADS of time working with my sites and receiving STELLAR support from ManageWP. Notice I didn’t use the word amazing 🙂 I was experiencing the a massive inability to clone/migrate which is one of the great features of MWP and a must-need for website development. So, after a LOT of back and forth, MWP got to the bottom of the problem and then created an updated version of the Worker Plugin. There was an issue how my host provider created the WP database and they recognized it as an opportunity to improve the plugin. Second, I have successfully figured out how to manage my locally hosted (using MAMP) websites through MWP as well. Once you understand the process it”s pretty straightforward and massively useful. I can now test to my heart’s content and, when ready, clone to my live site directly from my locally hosted test site. Nice stuff!!! MWP earns my “freaking love” as well. Cool. Hit me up on twitter @cdils if you have any questions about it. Have you compared ManageWP with WP Pipeline at all? Pipeline appears to be cheaper, and no recurring monthly costs. InfiniteWP seems to have the best price of all (free), and WPRemote is made by “Human Made Ltd”, which makes my favorite backup-plugin of all time… but the version they include with WPRemote only backs up to Amazon S3, which is sort of a pain. I can’t believe I didn’t think to look for central WP management tools before now. I’ve been tirelessly logging into tens of sites to do upgrades at least once a month for the past 2 years. Always fun when you find a 2-year old site that never got a security plugin installed (and hasn’t been hacked yet, amazingly). I’ve compared to InfiniteWP (there’s good discussion in the comments on this post), but not from Pipeline or WPRemote. Thanks for pointing them out! Thanks for your post – I’m seriously considering signing up for managewp based on your rec… do you know if their backups are fairly easy to restore? One thing I like with backupbuddy is that it’s not too hard to get a site back up & running. They don’t have a built-in restore tool, so it’s definitely not as slick as BackupBuddy there. 🙂 What you have is just your backup files (and database) that you’d need to manually load back up to your server. In the past year I’ve moved most of my sites over to Managed WordPress hosts (Flywheel, WPEngine, Synthesis) and each of their plans include a one-click restore that trumps even BackupBuddy. The main features I’ve settled on over at ManageWP are the updates/cleaning tools. It’s so nice to update all plugins and clean out all spam comments across multiple sites with one button push. Take it for a free spin on their trial and then decide if it it’s something you’d use. Carrie, I believe they do have a restore feature which is paired with their manual or automatic backups. It works quite well. They just came out with a major release. Sounds great, in theory. However, I can’t get it to auto update any plugins on any WordPress site at all? If not, then that is worded terribly? My bad – I hadn’t seen that and haven’t tried it. Have you reached out to their support crew for troubleshooting? Yes, it is all sorted now. We had a few hiccups along the way due to restrictions with WP Cron from a few hosting companies, but in all fairness their tech support were very understanding and willing to help and an alternative has been used, which allows all the WordPress sites I manage to automatically update the plugins. Obviously, and I have to stress, having things like this set to automatic can lead to problems with plugin compatibility etc, so it’s always worth doing your homework on the plugins used first. If in doubt, leave it set to manual. Great informative post about ManageWP. I am going to try ManageWP to mange my 3 WordPress-based sites. I’ve been thinking about investing in this myself (as I’ll be taking the leap and starting to freelance design full time soon). A few questions I had if you don’t mind answering. 1 – if I buy a professional plan for say, 5 sites, but then I find I need more over time, can I upgrade to have more in my plan period? and also (theoretically) I could buy a plan for five sites, and then just add/remove sites as I need to work on them, right? 2 – Is the cloning tool really that simple? Like you click clone everything from this site to that site, or do you have to go into FTP and do some stuff yourself? 3 – and last, when you say you can save the backups to email, does that mean I can download them and save them to my own computer? 1.b. Yep – Say of those 5 sites you stop managing 1… you can remove that site and add another. Just so long as the total equals your plan number, it doesn’t matter which site. 2. Indeed – it’s a code-free clone! As I noted in a this comment on a different post, this feature tends to work best on smaller sites. I use MWP extensively. Yes, the clone tool is dead simple. temporary sites don’t count towards your site total (if you are running them locally). Updating multiple sites’ plugins and core is a massive time saver and backing up is great because you can direct to S3 or Google drive. I didn’t realize that temp/local sites didn’t count toward your goal. How’re you connecting? Thank you for taking the time to answer Carrie! That’s some great info. I think you’ve convinced me – it would be a super helpful tool and definitely something worth investing in! And I’ll check out that other read – I can use all the tips I can get when it comes to making the leap to freelancing! Thank you! I was just about to purchase iThemes, but this seems to have a bit more, and I love that I can asses the dashboard and work on clients’ posts, etc. This is amazing and thanks so much for your blog post! I don’t believe there is a way to custom-name backup files (and confess it hadn’t occurred to me to do so until reading your comment). I’d suggest pinging the ManageWP folks and putting that in as a feature request. Just being nosy, but what’s your use case for a custom file name? Ah, I got ya. The structure it saves out as (at least for Dropbox) is /ManageWP/website-name/backup-MMDDYY-full.zip. No harm submitting your suggestion as a feature request to the ManageWP folk. That could be a helpful feature. Informative post with well explanation .Thanks for sharing it. I tried out ManageWP, and liked it well enough, but I found that MainWP (https://mainwp.com/) provides a much nicer user experience, and way more free functionality (https://mainwp.com/features/) right out of the box. Not to mention, there’s no limit to how many sites you can install it on. ManageWP is a great tool, with affordable monthly rates, but once I tried MainWP there was really no comparison!